Ever wished the joy of crispy chocolate mint cookies could be part of your diet plan? If so, your wish has been granted. You’ll not only enjoy the taste of the minty thin cookies you sometimes crave, you’ll also get all the benefits of 15 grams of quality protein and 10% of your daily value of Calcium. Good nutrition, great taste and lots of crispy fun make this high protein bar an exciting addition to your healthy diet. Excellent bar! This one and the peanut butter dream bar are my favorites. The mint taste is refreshing and the bar fills you up. Yum!! This is a great bar. You just have to watch it, because they are SO GOOD you could easily eat half the box. Been there, done that. You would never know it was a low carb, hi protein bar. What a treat!!!! These bars taste just like the Girl Scouts Thin Mints! Unbelievable! They almost burn they are so minty!! But they taste pretty good! Please contact us to submit your review for Crispy Protein Bar Chocolate Mint (7 ct) - BariWise. 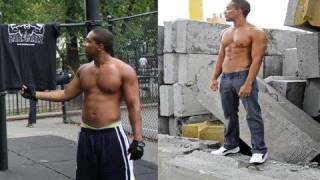 30lbs WEIGHT LOST No Weights, No gym , No Supplements ! !